My daughter used to stick most her hand into the dye and then she'd have a tinge of green on her fingers for the next few days no matter how much we scrubbed them. Her friends would be all, "What's wrong with your fingers? Are you sick?" and sometimes Natalie would say, "Yes," and giggle when everyone would take two large steps back, lest they also get diseased. It's a popular thing to do around Easter, and kids love it. I know some parents love it and are like, "Who cares about the mess?" and my answer is, "I do. I care very much about the mess." 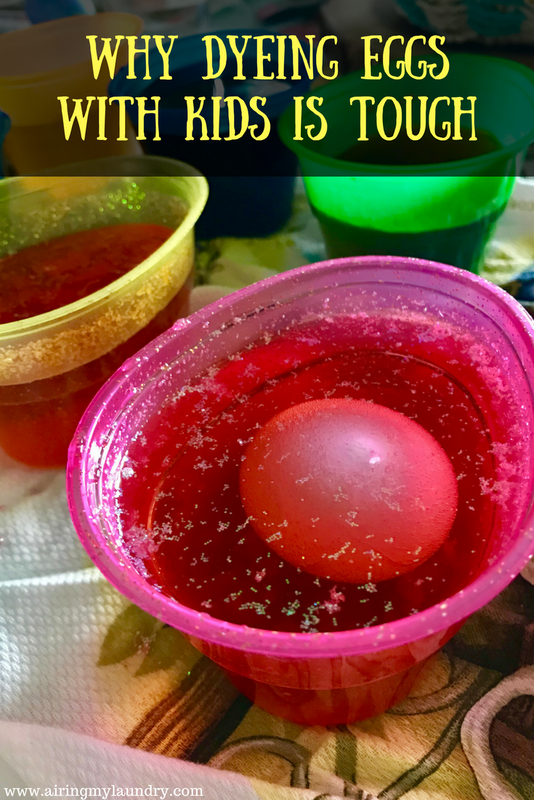 And then I'll get a story on how I should appreciate these moments, because I'll miss them when the kids move out, and I can say without a doubt that I will not miss dyeing eggs. "Do not get this on the ceiling," I warned Natalie, who rolled her eyes. "Gosh Mom, I was, like, FOUR when I did that," she answered. I even got my teenager out of his room, which smelled a little bit like a fart and dirty feet. When he begrudgingly left his cave, I quickly opened a window and sprayed a bunch of Febreeze. Since the kids are older, the mess isn't as terrible. So that's a plus. And I got the teenager out of his room. So that's another win. That's his hand. I guess he doesn't care if his fingers change colors even though he's in high school. Maybe it's cool to have colorful fingers there. I mean, after all, the unicorn trend is so in. So how do you feel about dyeing eggs? Have you already done it this year? Your kids are so cute. This year will be my first year when I will be dying the eggs. Till now only my mother did it. I wonder if I can get the dye on the ceiling as well. I only manage to get must once. 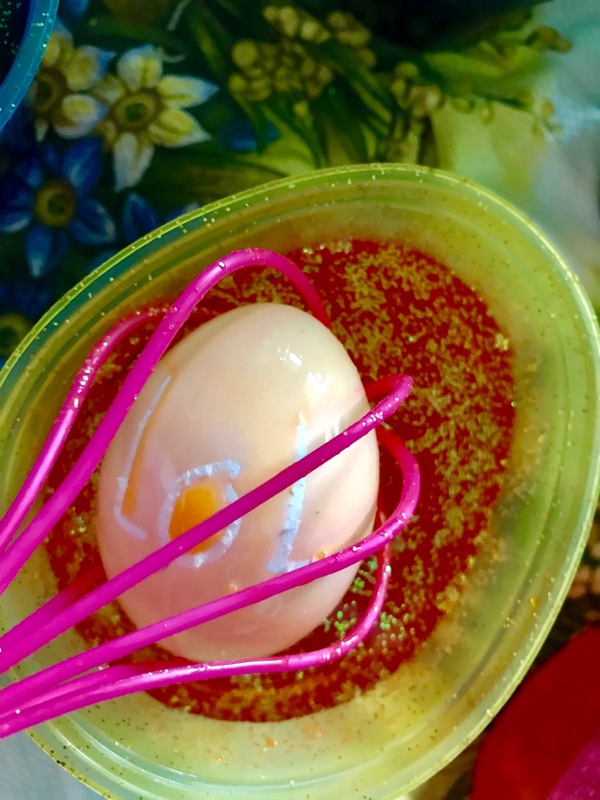 Dying eggs can also be fun when you have playful kids like yours. Doesn't the hard part get even when it's finished finally? You can't but love it. Nice experience shared. I know what you mean about the mess. I think the eggs turned out nicely! I don't have kids, but the kids in the family are always SO stoked about dyeing eggs. But dye on the ceiling is a nightmare. I actually skipped dying eggs this year. A four year old plus dye just didn't seem like a good idea lol. We used to do this when my kids were little but now that they are older, they lost interest in it. I admire your teenager because he still want to do it. I have two boys and we've dyed eggs a ton of times. We've always used dye from the store and there's never been a mess at all. We tend to only do it sparingly, and generally my in-laws take over. It’s not my favorite thing either! Love the activity but I kinda hate the mess. The pic of Natalie with the green fingers is so my kids. I have to admit I've not died eggs since I was young so I was the one making the mess, I can imagine why people try and not do it though haha! 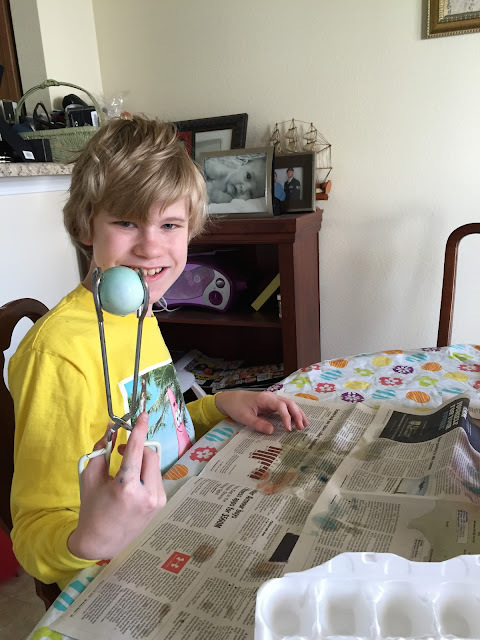 I haven't experienced dying eggs yet -I often buy, but my kids tried it at school and it's terrible, paints are all over his uniform, but he enjoyed it. When my kids were young, I hated it when they made a mess of "projects." But my mom said, to let them make a mess. It is a learning experience. Since then I did, but I chose a different area in the house that would be easy to clean up. 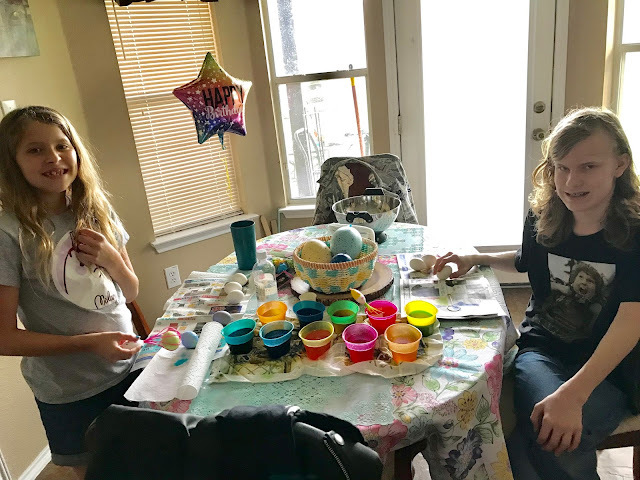 Dying Easter eggs was an activity they enjoyed. I have to admit that when I wa syoung and my mom would do this wiht my brother and I it was everywhere and I think one year we really made a mess and she said no more. unless you can be organize and not make a mess.. she continued to let us every year lol but still. The mess, it's really the mess. But the kids love it so much and it keeps them super excited. It's so much better to set up a table outside and just make the mess there. 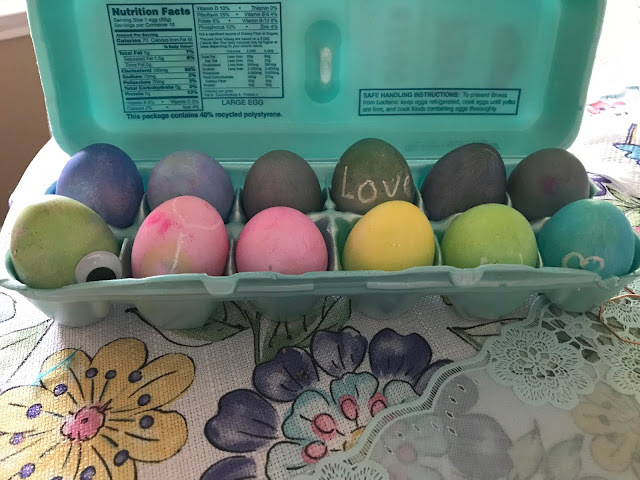 We haven't dyed eggs in years. I hate it so much! We are doing it this year because my oldest daughter is leaving Easter for boot camp. It was a special request by her. 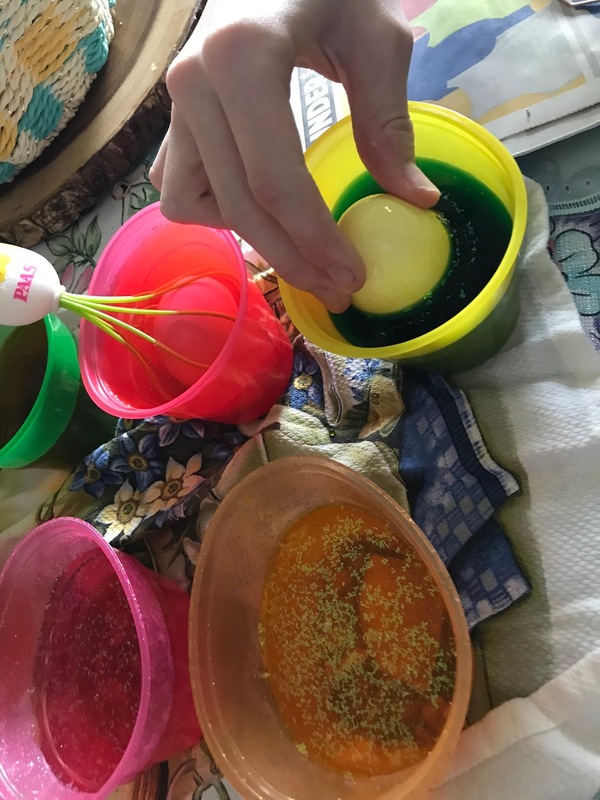 Dyeing eggs is a mess.. but like a lot of other childhood stuff, it is short lived and then I feel like I will be missing those days. This post makes me laugh a little while reading and imagining the scenarios in your post. Haha! Life with kids really is an enjoyable chapter of your life. Dyeing eggs is not tough, making it is more fun with them! I'm with you, dyeing eggs is one of the things I just won't miss. My oldest is over it all, but the six year old still wants to do it. I won't mention it, I will wait for her to say something or we won't do them this year. In prior years we typically wait until Easter day for dying eggs. I tend to try and make sure that the area is well protected and the containers don't have too much water. Since I only have to worry about it once a year. I don't mind the mess too much. Kids are MESSY!! I hate doing messy projects with my nieces and nephews, I get super anxious! LOL! I laughed quite hard at your daughter's story with her friends asking if she was sick. Lol. I hear you about the mess, I don't like it either but because my kids cant clean up the way I want them to, I end up doing the job in the end. This post is so honest! We totally appreciate you airing your laundry. It's more about the family activity rather than the outcome. I used to while I was a kid. Not sure why my mom was so cool about it. LOL. Thankfully my girls are more into the egg hunting than into the egg dyeing. I used to love dyeing eggs when I was young, we did them outside though as mum wouldnt allow it indoors. I haven't yet but if I do i am going to use turmeric. I am not a pinterest mom, lol i don't even know what that is, i just don't like eating chemicals. dying eggs is definitely a chore, but it's only once a year and my kids have so much fun with it! It's one of those traditions that I know will be short lived. This is really funny to read especially the part where it smells like fart and feet. Good to hear that your kids participated and did not make that much mess. Congratulations! They did a marvelous job of dying the eggs. It can be such a messy ordeal but I still let the grand kids do it even though I know I'll be cleaning up behind them for days. They are messy but it sure is worth it. You guys have some very gorgeous eggs! I love coloring with my kids. They always make a mess, but that is half of the fun for me. I loved dying eggs as a kid but I'm sure my mom did not love it as much haha. It's not easy to deal with the mess which I'm pretty sure I did when I was younger as well. I don't have kids of my own but I do know how you feel. We just did it last night and it was a blast. We always have fun and wacky ideas. My family is planning on doing this Saturday and Ill put them around the house as decor for Sunday. This post was very true, It was pretty difficult last year trying to tell my kids not to dye there hands, lol. Thanks for sharing. We dyed eggs today but we do it with this weird Ukranian dye that stains like crazy. We ruined one of our dining chairs today when someone knocked over the blue and splattered dye all over it. Good times. We’re actually doing ours tonight! I can’t wait, I get super excited around any holidays with traditions! I've always loved coloring eggs with my boys but it can get messy sometimes. I love the finished products, though. I NEVER did this as a kid, probably because my parents didn't want to deal with the mess. However. I would love to do this with my nephew! 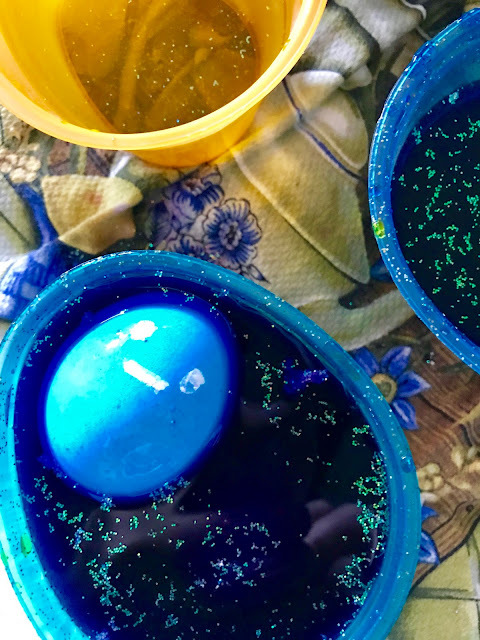 We love to dye Easter eggs ever since the kids were toddlers! The whisk idea works great! I find that your family is adorable and doing these simple activities together unites, immerses you in the spirit of the party and fills you with joy! Such a fun post! Strangely, I don't mind the mess when it comes to crafts with my kids. But yeah, cleaning mess off of the ceiling would NOT make me happy. One year I had this idea to add fine glitter on our eggs and we had glitter in our hair and face for DAYS along with dyed fingers. Good times. And that is EXACTLY why I don't do it. I have never been the kind of mom that is ok with messy stuff, so I just buy those crappy PAAS kits and do those on our eggs instead. I remember back in the day when I was growing up and mom would have to mix all kinds of stuff to make the dye. I go the easy way and grab those kits. I can't take the mess either. 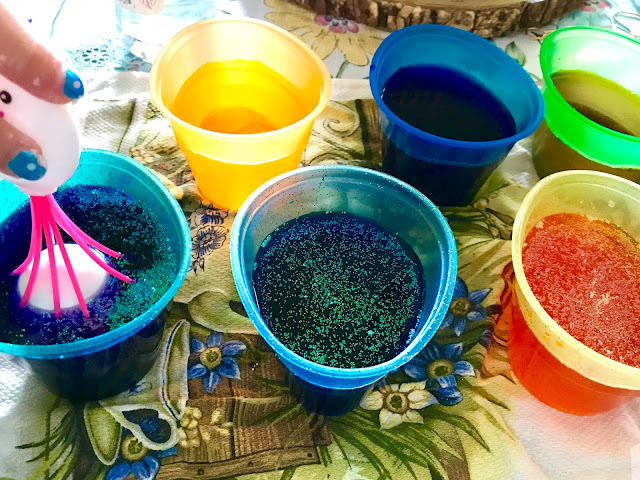 I love dyeing Easter eggs with the kids because of the tradition and knowing the kids have fun. But I agree, the mess is a pain. I can imagine this is a bit of a task, I remember making these when I was a kid and making a huge mess! Can I be totally honest? I've always HATED dying eggs as a parent. As a kid it was momentarily fun, but I never wanted to eat the eggs after and then the mess as an adult ... oh boy! We used to have so much fun doing this. I never looked forward to the mess. However, my kiddos loved it. I totally agree so I've been focusing on plastic everywhere and rather than dying them, we paint them. My kids always want some trending, specific character custom painted. Ack! lol I remember dying eggs as a kid with my mom, it was MESSY!!! lol Great fun but messy. It looks like a really big terrible mess. The memories are something for a positive spin on it even if the mess isn't quite worth it. Oh I can relate! haha. It's so messy but kids loves to do it so sometimes we do not have a choice. I can't tell you how many years of Easter, for weeks after I was covered in dye. I felt like a tye dye shirt at school. We don't dye eggs, but we dye t-shirts... Or maybe I should say that I do. Haha. My kids sit around and watch me as I lay garbage bags on the floor and get everything ready. Then when it comes time to dye them, they lose interest, quickly. Maybe this will be the year they care. haha. I intend painting some eggs with my kid this weekend. Although it's fun, I am not looking forward to the mess. Wonderful memories though. My husband loves to dye eggs, I was hoping to bypass it this year since our kids are all out of high school. I have a friend who makes beautiful psyanky eggs. We haven't dyed eggs yet this year. However, we look forward to it and never can wait! We have contests and what not that we do every year among the family. Dyeing eggs is definitely one of those things that make a mess. Not only that, but none of us actually eat the eggs! So it takes so much setup and prep work, for pretty much nothing! Great post, it can be tough! Just wear some old clothes and then get rid of them! My son bring back dyed eggs from school . I have to send 6 hard boiled eggs for school. Yes kids love to color the eggs, I tried both food color and natural color with onion cover. I agree with you these are fun moments, we get only when they are young, once they grow up they are not going to do that. Yes it is super messy! I haven’t dyed eggs since I was little and remember the mess. They have cool egg coloring mechanisms now, think I will buy one. Love the eggs though! Ha-ha! Honestly, I can also relate. Dyeing with kids is super tough and too much cleansing will just have to go one after the process. Well, it's fun but...oh my!I'm not ready to do such cleaning. We're tried to do this with the boys, but honestly, it's more of a headache than a joyous experience. Hahahahahaha the story of my life! I don't like messes and they can do their art craft at school! You made laugh and I have to tell you: I love coming to your down to earth blog! It looks you have the best time while doing this. They look so enjoy what they doing. Love this post. It is a combination of fear and fun really. Imagine how it will be, anyways it's going to make the kids happy. Certainly a must try.